If you are in DKA, it’s likely that you are nauseous or vomiting. Your breath may have a fruity or acetone odor as your body tries to offload ketones through your breathing. It’s likely that you will be dehydrated with very high BG levels and excessive urination. You might have aches and pains, and perhaps blurred vision. Not fun! 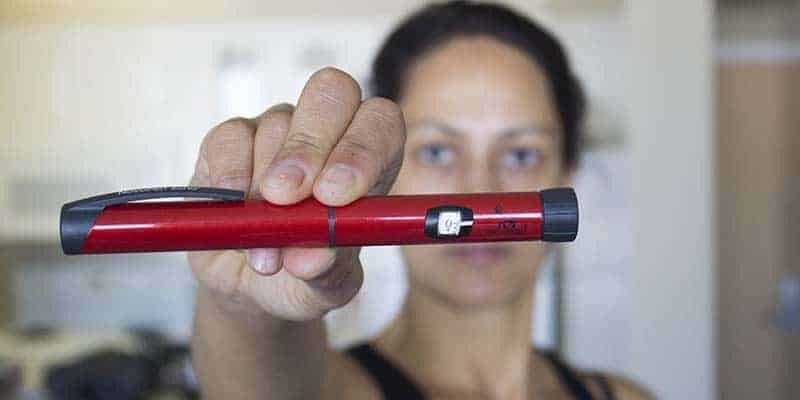 DKA is serious, and can be life-threatening. Because of dehydration and excessive ketone production, the blood becomes acidic. This is caused by a lack of working insulin. Most cells preferentially burn glucose for fuel. Many cells can also burn fat in small amounts. While glucose burns “cleanly,” fat produces waste products called ketones. Ketones are acid and upset the pH balance, essentially polluting the atmosphere in our bodies. We don’t tend to burn much fat at a time, so small amounts of ketones can usually be broken down and burned off along with glucose. 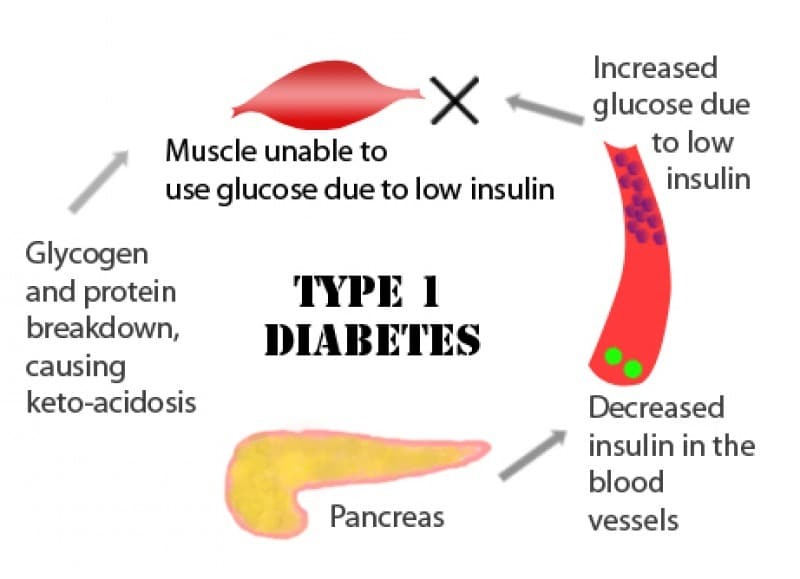 It’s necessary to have enough glucose in the body cells so there is a fuel source, and we also need to have insulin to move the glucose into the cells, where it can be used for energy. If there is no insulin, the glucose can’t get inside the cells. The cells are then forced to burn fat as an energy source, and this causes large amounts of ketones to be produced. Although some ketones will be eliminated through the urine, there will be too many ketones in the bloodstream and it will be too acidic. This is made worse by dehydration. The liver will make too much sugar, and BG levels will be high. This will cause excessive urination, and dehydration occurs. It doesn’t sound pretty, does it? 1. Sickness – Stress hormones are produced in response to illness, infection, and dehydration, and stress hormones work against the action of insulin. When you are sick, your insulin doesn’t work as well because it’s being impeded by the stress hormones. 2. No insulin – Forgetting to take insulin, especially basal insulin, will get you in trouble with ketones. Chronically missing or skipping mealtime insulin will also cause high blood sugar and lead to ketone development. 3. Spoiled insulin – Insulin can spoil if it is exposed to temperature extremes or if it is too old. Know how long you can use your insulin once the pen or vial is opened, and discard it when it is at the end of its useful lifespan. It’s also possible that you can become insulin deficient when your insulin is sitting in the tissues and not absorbing into the body where it can be used, so be methodical about rotating your sites. 4. Pump malfunction – If you are on an insulin pump and it malfunctions, you will be insulin deficient within 3-4 hours after the last insulin was received, because there is no long-acting insulin. We are relying on small pulses of rapid-acting insulin to function as basal insulin. If this delivery is interrupted, it doesn’t take long for a sharp rise in BG to occur, and for ketones to be produced. Therefore, it’s especially important to be vigilant and quick to identify problems when you are on a pump. With an insulin pump, any time you have an unexplained high BG, check for ketones. This is best accomplished with a meter that allows you to check for blood ketones, because it is a more “up to the minute” assessment of your status. A value of 0.6 mmol/l or more on a blood ketone check is considered significant and actionable. If you can’t check for blood ketones, check for urine ketones. Take action if the ketone amount is small or more (>15 mg/dl). There is a lag time for ketones to show up in the urine, but it still gives us an idea of your status. By the way, urine sticks in vials are good for 6 months after the vial is opened, or the expiration date, whichever comes first. Change out everything – open a fresh vial of insulin and get new tubing, cartridge, and infusion set. Don’t go right next door to where the last infusion set was, either – move to a new area and make a fresh start. In order to avoid having trouble with the pump’s insulin delivery, limit periods of disconnection or suspension to less than an hour. If you need to be disconnected longer than that, reconnect hourly and bolus for the basal insulin you will miss in the upcoming hour. It also pays to check your site and tubing at least once a day so you can promptly address any problems you might find, such as loose adhesive, a bloody site/cannula or air bubbles in the tubing. The system should be airtight, so smelling insulin when you are not in the midst of a site change is a huge clue that something is wrong. Be attentive to alerts and alarms from your pump, since you don’t want to miss a message that the insulin didn’t deliver or there was a blockage. Pay attention to how much insulin remains so you don’t run out of insulin. Be sure you change your site at least every 72 hours, and rotate your sites in an organized, methodical way so you don’t repeat the same spots too often, since this can lead to scar tissue and poor insulin absorption. If you use room-temperature insulin, you are less likely to get air bubbles when you fill your reservoir. Anyone with Type 1 diabetes is at risk for DKA, but the risk is higher for pump users. It pays to stay vigilant and be quick to intervene when BGs are high and corrections are not working. An ounce of prevention is worth a pound of cure! Post courtesy of Gary Scheiner MS, CDE and his clinical team at Integrated Diabetes Services. His practice provides individualized diabetes management and advanced education services for insulin users worldwide. For more information, visit Integrateddiabetes.com or call (877) 736-3648; outside N America, call +1 (610) 642-6055. LCHF diets are not a risk factor for DKA! Dietary ketosis produces ketones at MUCH lower levels than are present in DKA, and a body that is adapted to a ketogenic diet has no problems using ketones as fuel, by definition. Please don’t mention, associate, or confuse dietary ketosis with DKA, it’s a gross mis-service to your readers. I agree with you that the text around diet and ketosis is confusing, and I have therefore temporarily removed it and asked the post author to clarify. Just to be clear, the text wasn’t actually incorrect. A low carb high fat diet does lead to higher than normal ketone levels (that’s the whole point), and the text specified that these ketones are different from the ketones you see in ketoacidosis. However, the context the text was in made it misleading, as it made it look like a LCHF diet was a risk factor for ketoacidosis in the same way as taking too little insulin or being sick.